In 2008 the first in a series of symposia established a ‘social realist’ case for ‘knowledge’ as an alternative to the relativist tendencies of the constructivist, post-structuralist and postmodernist approaches dominant in the sociology of education. The second symposium focused on curriculum, and the development of a theoretical language grounded in social realism to talk about issues of knowledge and curriculum. Finally, the third symposium brought together researchers in a broad range of contexts to build on these ideas and arguments and, with a concerted empirical focus, bring these social realist ideas and arguments into conversation with data. 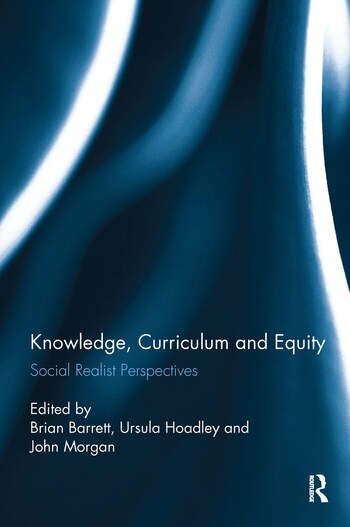 Knowledge, Curriculum and Equity: Social Realist Perspectives contains the work of the third symposium, where the strengths and gaps in the social realist approach are identified and where there is critical recognition of the need to incrementally extend the theories through empirical study. Fundamentally, the problem that social realism is seeking to address is about understanding the social conditions of knowledge production and exchange as well as its structuring in the curriculum and in pedagogy. The central concern is with the on-going social reproduction of inequality through schooling, and exploring whether and how foregrounding specialised knowledge and its access holds the possibility for interrupting it. This book consists of 13 chapters by different authors working in Oceania, Asia, Europe, Africa and North America. From very different vantage points the authors focus their theoretical and empirical sights on the assumptions about knowledge that underpin educational processes and the pursuit of more equitable schooling for all. Brian Barrett is associate professor in the Foundations and Social Advocacy Department and graduate research coordinator with SUNY Cortland's Urban Recruitment of Educators program. Ursula Hoadley is an Associate Professor working in the School of Education at the University of Cape Town. Her work focuses on pedagogy, curriculum and school organisation at the primary level, and she has published extensively both locally and internationally in these areas. John Morgan is Professor of Education at the University of Auckland. His research interests are in geographical education, the politics of the school curriculum and the cultural politics of schooling.